Move bulky, bagged or palletized material quickly and easily. Put it to work on applications such as industrial plant and landscaping work, construction sites, farm chores, fertilizer handling and municipal projects. The 36 in. forks can be manually positioned to fit a variety of pallet and material sizes. Lifting and tilting materials is easy with the integrated joystick controls. The pallet fork is designed with the M.A.X (Multi-Attachment X-Change) system which allows attachments to be changed trouble-free and without tools. Adjustable 36-inch teeth: Easily adjust spacing between the teeth. Rated Operating Capacity: Transport up to 450 lb. of materials at a height of 18 in. Multi-Attachment X-ChangeTM (M.A.X.) 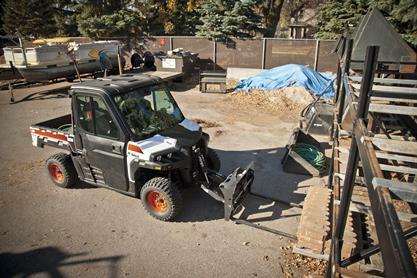 System: Makes easy work of attaching and detaching the pallet fork from the utility vehicle. Fast and easy mounting means spending less time on attachment changes and more time on the job. Visibility: Good visibility at ground and lifted heights.